Someone was scheduled to play first base in today’s game but his name was blacked out on the lineup card clipped on the fence next to the Phillies bench. Jake Holmes name was inserted at first instead. It was good it was. All Holmes did was hit a homer, triple and double. He played a “gold glove” caliber first base as the under 21 in age Phillies downed Oakton Community College, 8-1. It looks like Holmes is ready to have a break out season but he appeared to be a player without a position. 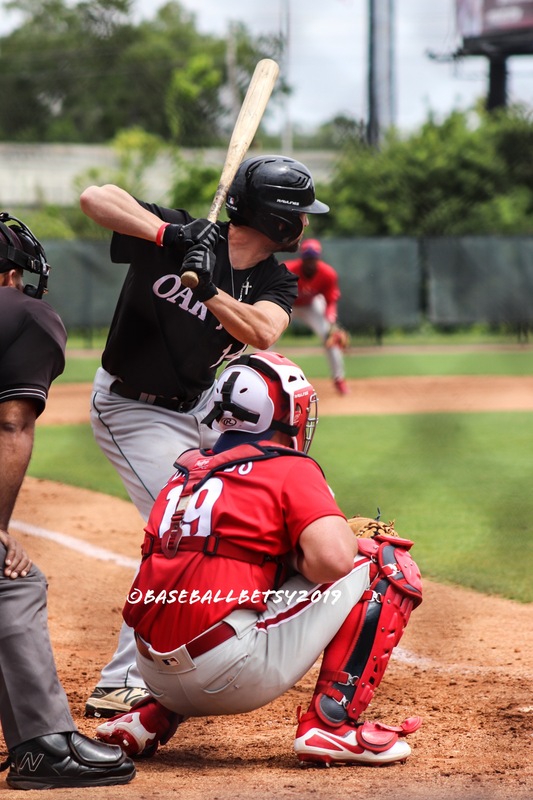 He played short and third last year in the Gulf Coast League and with Williamsport in the New York-Penn League. He looks ready to do some damage somewhere and who know at what position this year. We wanted to see see the very young guys in the Phillies system play and they came through, tough the opposition was age appropriate their skill set was not. We passed on watching the likes of Harper, Realmuto and Franco among other Phillies 25-man roster guys playing on the other backfields of the Carpenter Complex. Holmes played like he belongs at a much higher level. All three of his extra base hits were aimed at an old oak tree over the the fence in left and in front of busy Rt. 19. His homer was a blast right at the old oak tree. His triple was hit deep to left center and his double was lined over the left fielder’s head. Watch HERE. What caught our attention was Holmes play at first base where he made all the plays. 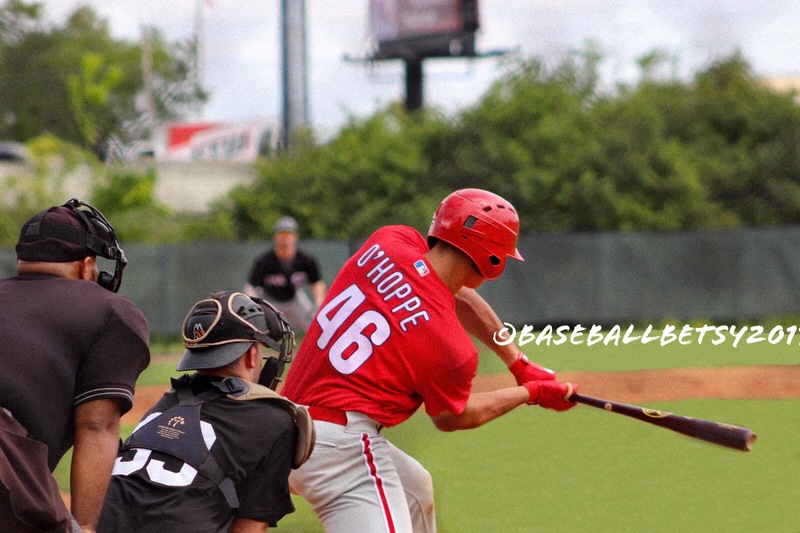 According to MiLB fielding stats, he never played at first in his two-year Phillies career after he was signed as an 11th round 2017 draft pick. Initially, we came to watch catchers Logan O’Hoppe and his backup Mitchell Edwards. O’Hoppe lined a single in the first inning. Watch HERE. Next up was another favorite, right fielder Carlos De La Cruz, who also lined a single in the first inning. Watch HERE. 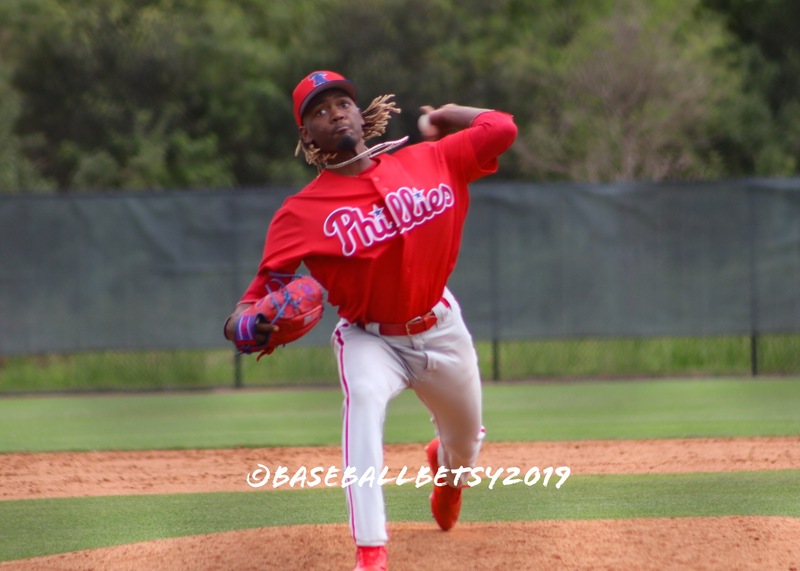 Also we saw good Phillies pitching including starter Tyler McKay and relievers Hsin-Chein Lin, Starlyn Castillo, Gabriel Cotto, Kyle Arjona and Jaylen Smith. Most of the guys we saw on Monday will stay behind when the minor league camp breaks at the end of the month for extended spring training games. Then, they will be on to Williamsport or the GCL Phillies in mid-June to start the half season leagues. 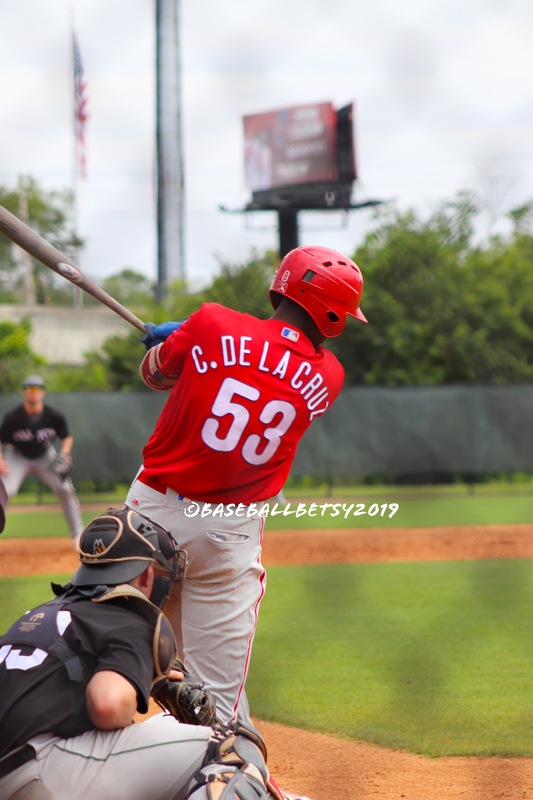 This entry was posted in 2019, March and tagged Carlos De La Cruz, Gabriel Cotto, Hsin-Chein Lin, Jake Holmes, Jaylen Smith, Kyle Arjona, Logan O'Hoppe, Mitchell Edwards, Philadelphia Phillies, Phillies Young Talent, Starlyn Castillo, Tyler McKay. Bookmark the permalink.